"You need to ask the right person, for the right amount, for the right project, in the right way, and at the right time." The same holds true in grant writing. Step one is finding foundations that may fund your work. Step two is determining the proper amount to request from those foundations. One of the biggest mistakes I see nonprofits make is asking a foundation for too much money. Nonprofits often ask for what they need, instead of what the foundation is likely to fund. There's a difference. So, how much should you ask for in your next grant proposal? The answer will vary, from foundation to foundation, so you'll need to decide on a case by case basis. The good news is you can determine the "right" amount to request from each foundation by doing a little bit of research. 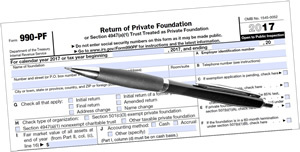 Just like your nonprofit, a foundation files an annual tax return. Theirs is called a 990-PF. The PF stands for "Private Foundation." These 990-PF tax forms (just like your nonprofit's 990) are publicly available documents. Sites like the Foundation Center, Guidestar, and the National Center for Charitable Statistics allow you to view 990s and 990-PFs. WHAT DOES A 990-PF LOOK LIKE? A blank 990-PF is 13 pages long. The completed form can be dozens - even hundreds - of pages longer. It can be a little daunting the first time you look at a 990-PF. To help you navigate all those pages, we have a handy cheat sheet to help you "read" the tax form. This PDF will show you exactly what grant seekers should look for when using a 990-PF as a research tool. If you'd like to receive a copy of "How to Read a 990-PF," just let us know. There's a lot of useful information in a 990-PF, starting with the organization's name, address and telephone number. Why is something so simple so important? It's a great idea to try and talk to someone at the foundation before applying for a grant. Many foundations welcome (and even encourage) a pre-application call. That said, many smaller foundations have limited or no staff, so it may be difficult to reach someone. Part I, Line 24. Total Operating & Administrative Expenses will give you an indication of the foundation's size. Small number? That could mean a small staff or maybe no staff at all. Many foundation trustees are the founders, family members or friends who receive no compensation. Part I, Line 25. Contributions, Gifts & Grants Paid will tell you exactly what the foundation paid out in grants during the previous year. This number is another indication of whether the foundation is large or small. Contributions, Gifts, and Grants Paid is also your first clue in deciding what's an appropriate amount to request. I've seen well-meaning (and unwitting) nonprofits ask for more money than a foundation funds in total, all year long. This probably goes without saying: they weren't funded. Part III, Line 6. Total Net Assets is an important number. Even at face value, it's good to know because it's another indication of the foundation's size. What's more important to know is that foundations are required to distribute 5% of their net assets, on a rolling basis. So, a simple calculation (5% * Total Net Assets) will tell you what the foundation is required to distribute each year. Once you know Total Net Assets (and have done the 5% calculation) and you know Contributions, Gifts & Grants Paid, you have a range of what the foundation is required to give and what they actually did give the previous year. Part XV. Line 3. Grants and Contributions Paid During the Year or Approved for Future Payment is the most helpful information in determining how much to request. This information is often included as an attachment in the 990-PF since many foundations award dozens, even hundreds and sometimes thousands, of grants during the year. In this section (or the attachment), you'll find a list of recipients by name and award amount. You can use this information to see what's a typical award amount. Is it $1,000 or less? $5,000? $10,000 or more? To have the best chance at success, you want to ask for an amount that's in line with previous awards. You may find outliers - one or two or even a few grants that are much higher than what's typical. If you're making a first-time request to a foundation, you'll improve your chances by asking for a lower or mid-range figure rather than the high end. Part XV. Line 2. Information Regarding Contributions, Grants, Gifts, etc. gives you two critical pieces of information. First, there's a checkbox. If the box is checked, then the foundation "only makes contributions to pre-selected charitable organizations and does not accept unsolicited requests for funds." So, if it's checked (and you haven't been invited to apply), then you should look at other foundations. Second, if the box is unchecked, then the foundation does accept unsolicited letters of interest and/or grant proposals. When the box is unchecked, you'll find information here on how to apply, including submission deadlines and any limitations or restrictions on giving. Remember, there's more to grant writing than "writing." A lot more. Research is an important - yet often overlooked - part of the grant seeking process. When you're ready to research, if you're looking for a 990-PF, know that I have a free tool on my website that's powered by the Foundation Center. Use the 990 Search widget, and enter the grant maker's name or their EIN (if you know it). You'll get links for up to three years of 990-PF forms. Download the forms, and you'll be ready to start your research and see just how much they're giving away and to whom. Need help finding foundations to support your work? Or figuring out exactly what you should ask them for? Laura Rhodes can help.